OK, cool. So if you’re a history student at Oxford Uni, you must now sit a compulsory paper on non-White, non-British history. I mean, it’s cool – it shakes up the curriculum, and the term ‚history‘ is destabilised enough to permit a range of perspectives and events to be considered seriously. This also puts those people and those lives into more serious consideration – essentially making black lives matter. I mean it’s cool – and many activists and academics have supported the move, and agitated for broader adoption of the paper across British universities. However, one academic, Kehinde Andrews, associate professor in sociology at Birmingham City University, said that the compulsory paper was simply a perfunctory gesture. He added that the inclusion of black histories should be incorporated across the entire spectrum of education – and not just limited to one paper. There’s a point. A very good point. Having one paper is the equivalent of having a ‚black history month‘ – where stories and histories are compressed into a single, limited frame, temporal or educational, and thereby, paradoxically, cutting them off from mainstream history. The problem is that people are more prepared to accept that a dog is not just for Christmas but for life, than they are black history and black lives are not just for one month or for one paper – but for all history. This is an old debate – and it might not be as interesting if it didn’t occur in the same time-frame as a feminist-all-black event being banned in Paris on the basis of discrimination. Of course, the ban in Paris is different in context – but it does highlight an irony that if people (white people in particular) are excluded from an event, then there will be repercussions, but black lives are written out of mainstream history altogether without comment. But you know whatever. 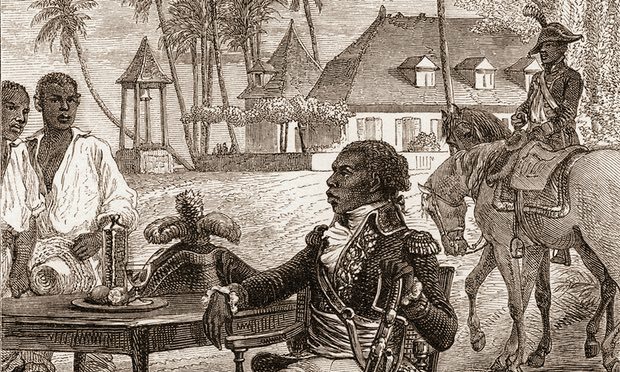 I still like the idea of rich white kids trying to get their heads around the Haitian revolution. That is an education indeed.